See our Birthday Party Page for Bazooka Ball Party info! 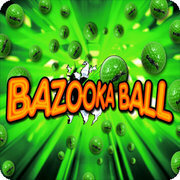 On Friday nights from 7:00pm to 9:00pm we change our laser tag arena over to Bazooka Ball. 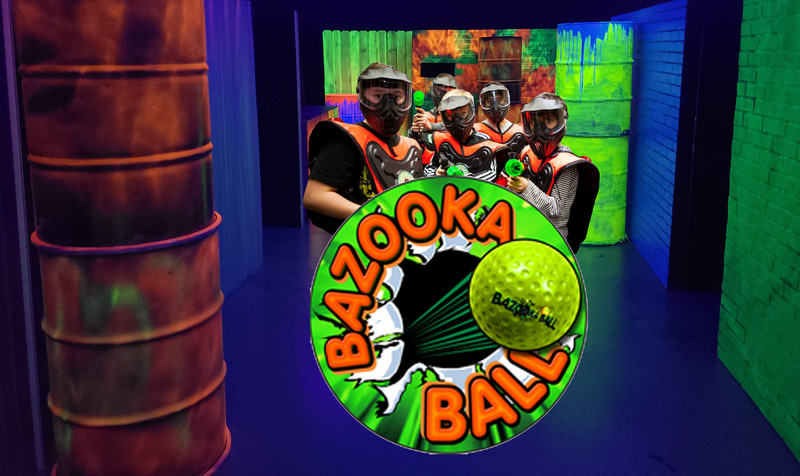 Bazooka Ball is a paintless paintball game that uses paintball markers that are equipped with special barrels that shoot golf ball sized foam balls! Players gear up with special vests that register hits that are reflected on an arena scoreboard. Each player is equipped with a safety mask and a paintball marker as they head in to our arena for a fun filled game! Dodge in and out of buildings, duck behind obstacles and see which team can score the most points! Each Bazooka Ball session is 15 minutes long, including time for a safety video and suiting up. Who Can Play? Players must be 8 years of age or older. Each person playing will need to have a completed wavier on file. Those that are under the age of 18 will have to have the waiver completed by a legal guardian. Come Prepared! It can get warm while playing, so dress light and ready for fun! Remember that whites and other bright colors can glow under black lights, and you don't want to stand out! Wear comfortable shoes. No opened toed shows or sandals are allowed! Reserve Your Spot Online: You can reserve your spot in a game before you even come into the arena! Click the link below to reserve a game time online. Remember to arrive 10 minutes prior to your game time. Your safety briefing will start at your game start time. If you do not arrive by your scheduled time you will have forfeited your spot in the game, and no refunds will be provided! Reservations are highly recommended as Bazooka Ball time slots book up quickly! How do I reserve two games for $14.00 plus tax? This offer is valid for two games played by the same player. To take advantage of this price, reserve your first game time at $7.50 plus tax. Once you have placed that game in your cart, the system will give you the option to add a second game of Bazooka Ball, or a game of mini golf, for the same player at $6.50 plus tax. You must schedule your second laser Bazooka Ball game at a different time slot than the first game. This offer can not be split between two players.